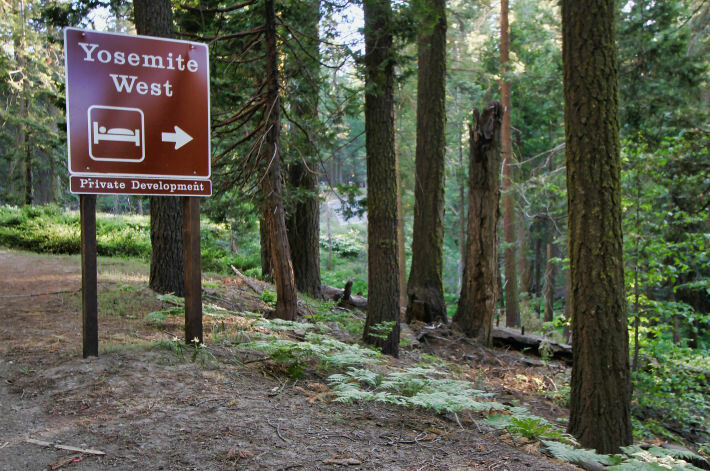 Yosemite West is a collection of bed & breakfasts, condominiums, and trophy vacation homes on Yosemite's western boundary near the Glacier Point Road turnoff. It's partly inside and partly outside the park itself, and only reachable through Yosemite. It's handy to lots of Yosemite locations: 9 miles (14.5 km) south of Yosemite Valley, 12 miles (20 km) north of the Wawona area, and closer to Glacier Point (if you're in a car, anyway1) than any lodging except the Bridalveil Creek Campground. Since the Bridalveil Campground is closed in the winter, it's also the lodging closest to the Badger Pass ski area - note that given its elevation of around 6,000 feet (1,800 meters), you'll have to carry tire chains if you're visiting Yosemite West in the winter, and there's a fair chance you'll have to use them. Law enforcement, unfortunately, does not consider "but this is a rental car!" to be an adequate reason for bypassing the chain-up areas. Other than the bed & breakfasts, there are no commercial establishments in Yosemite West. If you need supplies, the Wawona general store is slightly closer than Yosemite Village, but the village store is larger, and the markets in Oakhurst and Mariposa are larger still. You can buy gas at Wawona, but not in Yosemite Valley; if you're going that direction, the closest gas station will be in El Portal, about 20 miles (32 km) away. The Yosemite West area is heavily wooded but sits on a west-facing slope, and some of the homes have commanding western views. The really picturesque mountains are in the other direction, but a sunset here will still cast a nice glow on a bottle of wine, and it's likely that Yosemite West's views will outclass what you're used to seeing out your office window. 1 Technically, Curry Village is closer to Glacier Point - about 3,000 feet away, all vertical. Peering over Glacier Point, you'll probably think you could throw a rock to Curry Village, though the reverse definitely isn't true. Via conventional modes of transportation, covering that 3,000 feet requires a 10-mile hike or a 30-mile drive.